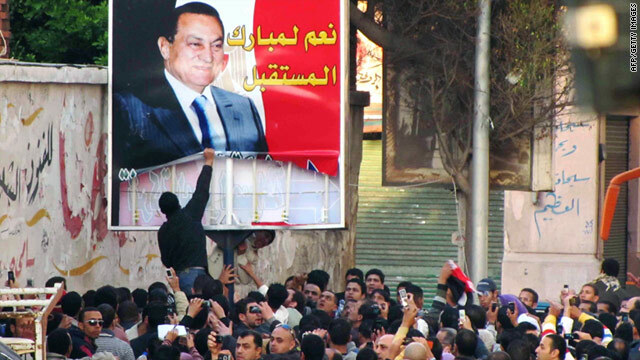 Egyptian protesters tear down a poster of President Mubarak in Alexandria on January 25. (CNN) -- In the United States, Americans feel protected by their Constitution. In Egypt, the opposite can be true. The Arab nation's constitution, recently amended in 2005 and 2007, was designed to preserve power for the ruling National Democratic Party and make it virtually impossible for anyone outside the ruling establishment to seek the highest office in the land. More than two weeks into the uprising, the debate centers on whether to dump Egypt's governmental road map altogether or decide how it can be amended to pave the way for a more democratic era. The departure of President Hosni Mubarak is inevitable now, be it in September or earlier. But what will replace the system of authoritarian government that has been in place for three decades? For any kind of democratic government to emerge, two things need to happen, said Bruce Rutherford, author of "Egypt After Mubarak: Liberalism, Islam, and Democracy in the Arab World." Rutherford said the parliament will have to be dissolved -- representation in both the upper and lower chambers lost legitimacy after what was widely seen as rigged elections in 2010 -- and the constitution will have to be overhauled. The irony is that only one man can make those things happen under the current constitution: Mubarak himself. But a way out for Mubarak's foes may surface in Article 139, discussed over the weekend in talks between Vice President Omar Suleiman and representatives of some opposition groups. Article 139 reads: "The President of the Republic may appoint one or more Vice-Presidents, define their jurisdiction and relieve them of their posts. The rules relating to the calling to account of the President of the Republic shall be applicable to the Vice-Presidents." "That's where the wiggle room lies," Rutherford said. Mubarak could keep the title of president, but deputize Suleiman to manage Egypt's transitional period. That would avoid the need for immediate elections and Mubarak would retain the power to authorize big changes. That's a solution that the self-declared Council of the Wise has pushed and one that several analysts believe is the best option for Egypt. Nathan Brown, a political science professor at George Washington University, called it an "ingenious constitutional solution." But can it work? Not without the sincerity of the Mubarak regime, said Brown, also a senior associate for the Middle East Program at the Carnegie Endowment for International Peace. Tuesday, Suleiman said on state television that Mubarak had appointed a committee to oversee constitutional reforms. Opposition groups have called for amending several prickly articles in the constitution that limit political participation. Several under discussion pertain to the sweeping powers of the president, requirements for candidates and rules for creating political parties. But Suleiman's announcement fell far short with tens of thousands of demonstrators, whose numbers swelled as the day unfolded and the lack of trust in the government was plainly evident. They did not believe that the regime was interested in real change -- only that Mubarak was stalling. "If there are real negotiations, they would be critically important," Brown said. "But I don't think they are."